The fourth season of Snooki & JWOWW follows our dynamic duo as they deal with the craziest adventure of all – motherhood. Jenni and Nicole have always joked about their desire to be pregnant together, and it’s finally happened! With both girls pregnant (Jenni’s first and Nicole’s second) and living next door to each other, the girls are growing up before our eyes. There’s always time for zany fun, though, and whether they’re attending yoga class together, making sushi for the boys, or preparing for Snooki’s upcoming nuptials … the season will feature lots of laughs among the tender moments. Series created by SallyAnn Salsano & Anthony Beltempo. S4 Ep.12 – i do. now what? S4 Ep.11 – it’s my bachelorette party…i’m single and ready to mingle! S4 Ep.5 – got gatsby? S4 Ep.4 – welcome home, meilani! S4 Ep. 1 we’re back–and we’re pregnant! 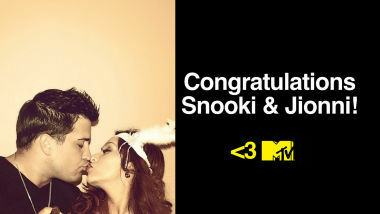 Snooki & Jwoww | © 2012-2014 MTV Networks, Viacom International Inc.